Photo View Postcard. Multi. Cardstock. 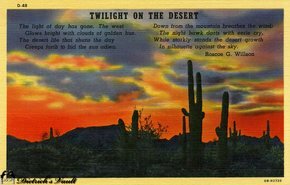 This linen-textured, color-tinted card is titled, "Twilight on The Desert." With a poem by Roscoe G. Willson. Lollesgard Specialty Co., Tucson, AZ. Genuine Curteich-Chicago C. T. Art-Colortone Post Card (Reg. U. S. Pat. Off.) Postmarked 1948.